When you think of 50s Cadillacs, you think big fins. But 1953 was a pre-fin year and everything was a little more restrained. The Series 62 was the entry-level Cadillac from 1952 through 1968 when it’s name was changed. The series was introduced in 1940. In 1953, Ghia of Italy ordered two Cadillac Series 62 Convertible chassis and had them shipped to Italy. They applied this gorgeous, stylized black coupe body with gold accents all around. The engine is the standard 5.4-liter V-8 making 210 horsepower. This car has slightly different styling than its sister car at the front and passed through the Blackhawk Collection more than 20 years ago before its current owners acquired it around the time of its restoration. As a 1950s American chassis with an Italian body – and it being one of two – it will be pricey. Click here for more info and here for more from this sale. 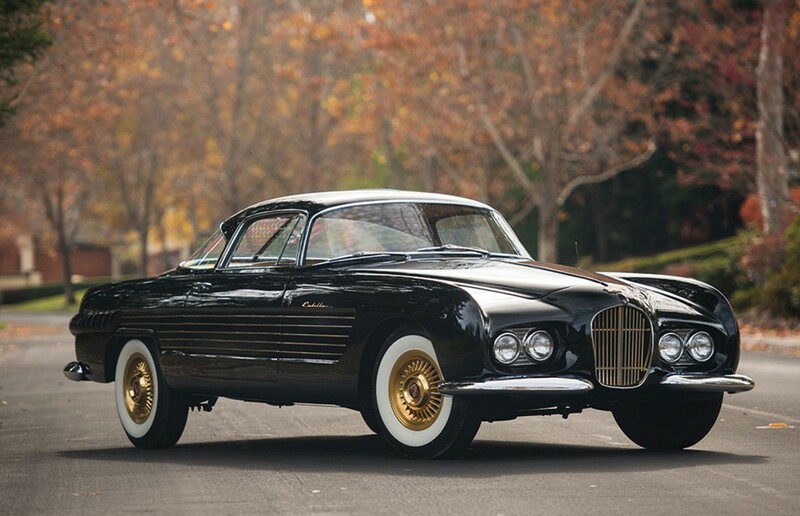 This entry was posted in Uncategorized and tagged 1953, auctions, cadillacs, cars, classic cars, coupe, ghia, rm sothebys, series 62 by classiccarweekly. Bookmark the permalink.